Richard Shindell, who whacked his finger with an axe about a year ago, seems fully recovered from the incident, which led to the canceling of some shows. Your intrepid humble blogger, following up on the not-quite-exclusive story reported on this blog last July, inspected said finger in the Narrows "green room" Friday night and took the above photograph before Shindell's entrance upon the stage. At first, Richard thought I was just going to photograph his now healed finger, which would have been weird, but I assured him I was looking to include his visage as well. A large enthusiastic crowd attended the show, which was so good that nobody thought about bringing up the damaged digit. One of the best concerts of the year at the Narrows! Blues guitar princess Danielle Miraglia (below) opened with a strong set. Oh my my! One of your humble blogger's favorites, Jonathan Richman, will make his Narrows' debut in June. Mr. Richman, who originally hails from Boston's western 'burbs (where your humble blogger once resided), wrote such great tunes as "Roadrunner" (covered by Greg Kihn) (Roadrunner once. Roadrunner twice. We're in love with rock 'n' roll. So let's stay out all night), "Pablo Picasso" covered by John Cale (Pablo Picasso never got called an -sshole), "Ice Cream Man" (I love your chimes. They reel and they rock), "I'm a Little Dinosauer" (I'm a little dinosauer, and I'm planning to go away), "I'm a Little Airplane" (I fly in the dark, over the baseball park), and many more. As you can tell, I really dig Jonathan; but I've never seen him live. Oh, abominable snowman in the market. Ooooweeee! Taunton native, and Narrows fave, Sarah Borges and her guys, the Broken Singles, have their new CD reviewed in the latest issue of Rolling Stone. Your humble blogger, who subscribes to the magazine, was delighted to come upon their 3-star review on page 83. It's on line too right here. Retro popsters The Spring Standards opened for Glenn Tilbrook Thursday night at the Narrows. The youngsters clearly listened to their parents' record collection and probably thumbed through high school yearbooks circa 1970. That said, they are talented vocalists, songwriters, arrangers, and multi-instrumentalists who brought the crowd to their feet. Keep an eye on these Big Apple-based up-and-comers! Glenn Tilbrook, the guy from Brits band Squeeze, tore into the Narrows Thursday night for the first time, showing that he's more than capable of making our now fabled stage all his own. He played Squeeze hits, e.g. Tempted, but mostly performed more recent stuff. His band featured several members of the current version of Squeeze, by the way. What can you say? It was the Narrows' 600th show--and what better way to celebrate than bring in one of the finest bands in the land--Los Lobos! They started off acoustic, playing several songs from the album "Kiko" and other tunes. After a break they came back strapped to their electrics. It was yet another sold-out show at the Narrows (thank you folks!) and another step as the Narrows continues to broaden its offerings. Another rather obscure Narrows alum has gotten recognition from Rolling Stone. 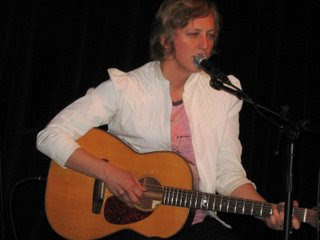 Read the write up on Ana Egge (in photo), who played the Narrows in 2007, right here. Narrows fave Sarah Borges and her guys have got a new video. Your intrepid blogger caught the Infamous Stringdusters in the act of stimulating the Fall River economy before their show Wednesday night at the Narrows. Above you see the group waiting for their grub at the Battleship Brewhouse, about a mile north of the Narrows. Let's see, how many guys at that table, ordering how much food and drink apiece...hmmm...of course that doesn't count the food your blogger chowed down on at a nearby Chinese restaurant, or the food, drink, gasoline and who knows what the pretty-good-crowd for a Wednesday night purchased before and after the show. The arts...more than pretty songs and pictures. You can take it to the bank! Narrows alum Justin Townes Earle (photo above outside the Narrows last fall) has received 4 stars from Rolling Stone for his new album. More here. 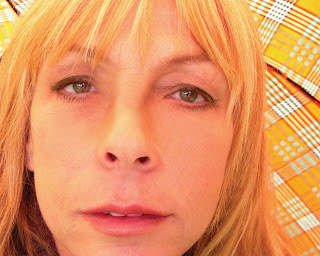 Just added--Rickie Lee Jones at the Narrows Tuesday, April 14. More info here. Keri Noble, who opened for James Cotten Saturday night at the Narrows, did not mention that one of her songs--"No One Will Listen"--is on Kelly Clarkson's brand spanking new CD All I Ever Wanted. Probably not surprising--After Keri finished her set at the Narrows, there was a long line to purchase her own new CD and get it autographed. People recognized a star, even when she's a rather obscure opener for a blues performer! Congrats to Keri. Your humble blogger was chatting with her before the show and found her very friendly and quite thankful that she was opening for James Cotten. He played with Muddy Waters for more than a decade. He played with Howlin' Wolf, Sonny Boy Williamson, Janis Joplin, Paul Butterfield, Johnny Winter, etc. But no matter where he's played, with whom he's performed, like everybody else a blues icon needs to arrive at the gig, do his thing on stage, and interact with the fans on some level. In the case of superharp James Cotton, he spent loads of times with his fans. He sold out the Narrows Saturday night, had a crack backing band that was worth the price of admission by itself, and signed and signed and signed after the show. Not bad for somebody 70-something years old. The Narrows loves you James Cotton! Stay well, 'cause we want you back as soon as possible. Rhode Island group Low Anthem, who played at last year's Narrows Festival of the Arts, was featured in Rolling Stone recently. It was darn near Martha Scanlan and Ollabelle Friday night at the Narrows, as the ego-less group members not only had Ms. Scanlan filling in for member Amy Helm, but celebrated her own music! Amy, with a new baby and involvement in her dad's rejuvenated musical career (Amy co-produced dad Levon's Grammy-winner "Dirt Farmer"), was missed but the group, nonetheless, impressed with their rootsy musicianship and winning personality. Above in the photo you see Martha taking the lead while the lovely and very pregnant Fiona McBean has a deserved breather and Byron Isaacs works the slide. Ms. McBean said she should be delivering next month. Ollabelle drummer Tony Leone (Lorne Entress of Ronnie Earl's band filled in for him at the gig) is the daddy. Monkee and Narrows alum Peter Tork is fighting cancer. If you have an Apple computer, you may have had trouble listening to Narrows' archived concerts on mvyradio.com. Your humble blogger has had a load of problems--but just found that the site apparently made some adjustments for Apple users. Try it again. Go to archives at mvyradio.com and go to "Narrows." Van Morrison, who is been on tour doing his "Astral Weeks" album, did a rare interview the other day. Don Imus had the honor. It's posted on the WABC site. Visit it here.